Did you ever ask yourself why, why God allows some of us to linger so long unable to communicate and seemingly disconnected from life? I’ve reflected on that a lot and it was Sister Jean who gave me the answer! Most of us here, if not all of us, know Jean’s radiant smile. It lighted up the whole room. Just call her name or give her a little kiss on the forehead, or touch her face and the brilliant light went on along with an attempt to speak! Icons, you may know, are understood as windows to heaven. Jean was an icon. She placed no obstacles to God’s presence in her. Her radiant smile drew me, and I presume everyone else, into the radiance of God’s presence. For the last seven plus years Jean fulfilled her ministry simply by being an Icon, a window to heaven. But a life time of kindness and fidelity went into creating that Icon. One day she and two other Sisters went to the beach. The other two went in the water, but Jean stayed on the shore. Suddenly she and others on the beach saw that the swimmers were in trouble. The tide was taking them out. Jean prayed to Mary promising to change her name to Stella Maris, Star of the Sea, a title of Mary, if Mary would bring them in safely. You know the rest of the story! Sister Jean Vogel, formerly Sister Stella Maris, and very briefly, Sister Anne Benedict was a lifelong educator who served in faculty and administrative positions at every level including adult education in parish and diocesan settings. Sister Jean’s ministry as a Grey Nun of the Sacred Heart included teaching at Little Flower High School and principal of Grey Nun Academy. She served thirteen years in several administrative positions at D’Youville College, including: Assistant Dean of Academic Affairs, Assistant Dean of Arts and Sciences and Assistant Registrar. Described by many as industrious and thorough, not missing even small details and always careful to do even that which may be considered on the far edge of her job, it was told to me that during one of those D’Youville years there was an opportunity for Jean to exercise these gifts. As she walked across the parking lot she happened to look up just in time to see a piece of paper being thrown out the dorm window of Julia Lanigan and Mary Elizabeth Looby both students there before entering the Grey Nuns. What she didn’t know was the why of what she saw. But Jean being Jean, she was most definitely going to find out! These two illustrious students were trying to get their work done but the constant noise of a car horn was more than they could handle. Mary Elizabeth wrote a note to the young man causing the noise telling him, in so many words, to get lost and then threw it out the window. That’s what Jean saw! Needless to say she would, and did, get to the bottom of this. Utilizing her teaching and administrative skills, she served in the Diocese of Trenton as Co-Director of the RENEW program and later as Associate Director/ Director of the Office of Evangelization and Parish Life. Then in 1991 she was called by the Congregation to do intracommunity service, and was appointed Superior of the Motherhouse Infirmary for seven years. In that capacity, Jean’s creatively and thoughtfulness found ways to keep the infirmary sisters engaged and connected. She always invited Sister Mary Elizabeth Looby to bring the young women who were inquiring about religious life in the Grey Nuns, to visit the infirmary Sisters on the second floor porch. On one such very memorable occasion they were invited to tell what brought them to the Grey Nuns. However, they got stage fright and couldn’t speak. Not to worry, Sister Jean very naturally turned to the Sisters and invited them to share their story. It became a most wonderfully sacred experience for everyone that day. During this time, the Grey Nun Associate Program was started. This was something Jean wholeheartedly believed in and very energetically became the first convener for the Yardley Associate group and remained active with them for seven years. Several Associates shared with me their memories of Jean’s leadership style during those years. She was so well organized in running our meetings; she served as a good mentor for future conveners. She called every Associate before every meeting to remind them of the meeting date. For years she tenaciously kept us together and was dedicated to our formation. Sister Jean kept us informed of pertinent topics of the day, always coming in with books, papers, articles and suggestions. Many of her suggestions involved urging us to get involved in community service in one way or another. Wherever we saw a need, meet it. We also learned to support one another. What wonderful lessons! She also was way ahead of her time because she introduced us to contemplative dialogue. We always shared at the beginning of our meetings and Sister would ask us to just listen, not comment on another’s sharing. Inevitably before the sharing was over, someone couldn’t resist commenting. We would glance over at Sr. Jean and see a little smile on her face as if to say, “I knew it.” Her leading was so gentle, so good humored, that you thought you were doing her a favor, but in reality she was passing on her gifts. As time passed she openly acknowledged she was no longer able to actively participate as her memory became more of a problem! We felt the courage and heartbreak in that acknowledgement. “Retiring” in 1997 she continued to serve within the Congregation until 2002 while also volunteering at Chandler Hall Hospice and Neshaminy Manor Nursing Home. The morning Molly died she told the aide on her floor that she was going to go home that day, but she would be back soon to bring Jean home also. Whether it was God or Molly who came for Jean, it’s fair to say she was greeted with a smile by her late parents Karl and Amelia Kiefer Vogel and her brother George. In addition to her religious congregation she is survived by her sister, Anne Watson and nieces and nephews. Thank you, Jean. Thank you for the gift of your life, offering no resistance to becoming a window to heaven, an Icon. This lifelong educator served in faculty and administrative positions at the elementary, secondary and college levels and was engaged in adult education in parish and diocesan settings. She received her BS in Elementary Education from Geneseo State Teachers College and an MA in Administration and Supervision in Elementary Education from Northwestern University. Prior to entering the Grey Nuns of the Sacred Heart in 1953, she taught in Highland Park, IL and Rochester, NY. Her education ministry as a Grey Nun of the Sacred Heart included Little Flower High School and Grey Nun Academy, the latter as Principal. 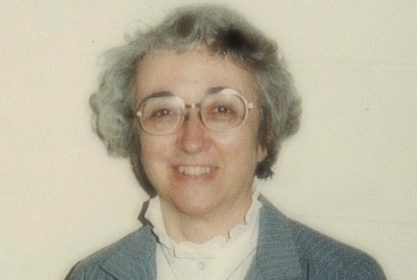 Sister Jean served thirteen years in several administrative positions at D’Youville College, including: Assistant Dean of Academic Affairs, Assistant and Dean of Arts and Sciences and Assistant Registrar. Utilizing her teaching and administrative skills, she served in the Diocese of Trenton as Co-Director of the RENEW program and later as Associate Director/ Director of the Office of Evangelization and Parish Life. Called by the Congregation to service within the community, she was the Superior of the Motherhouse Infirmary for 7 years. During this time, she was the first convener for the Yardley GNSH associates group and remained active with the associates for many years. “Retiring” in 1997 she continued to serve within the Congregation until 2002 and also volunteered at Chandler Hall Hospice and Neshaminy Manor Nursing Home. In 2008 her retirement years became a Ministry of Prayer. When her health needs required additional care she moved to St. Joseph Manor in 2010 where she cheerfully greeted her companions, staff and visitors with a smile until her death. Daughter of the late Karl and Amelia Kiefer Vogel, she was born January 1, 1926 In Cohocton, NY. In addition to her religious congregation she is survived by her sister, Anne Watson and nieces and nephews. She is predeceased by her brother, George. Services at the Holy Redeemer Sisters Chapel, 521 Moredon Road, Huntingdon Valley, PA 19006, will be on Saturday, February 18, 2017. Viewing time from 9:30 until 10:15 a.m., followed by the Mass of Christian Burial at 10:30 a.m. Burial immediately following in Resurrection Cemetery, Bensalem, PA. In lieu of flowers, memorial donations in Sister Jean’s memory may be made online to the Grey Nuns of the Sacred Heart, or by mail at the following address:14500 Bustleton Avenue, Philadelphia, PA 19116. Sister Jean Vogel’s family wishes to thank all who made her funeral a sacred and memorable service. We also thank Father Gleason, Sister Diane Bardol for “Reflections”, the beautiful music and all who contributed. We Especially thank all who attended the mass and for their kind words and good wishes. The delicious luncheon was a fitting ending. May Jean rest in peace. Jean Vogel showed us how we should live our lives in service to others. She will be sorely missed, and the world as we know it will not be the same without her. Please put in a good word for us upstairs, Jean.